Side note: in NYC it’s (House)(ton) and here in Texas it’s (Hue)(stun). So who’s right? I keep using the NY version of the pronunciation, luckily no locals have heard me do it. I guess it depends on where you’re at on which one is correct? We were lucky enough to have some great recommendations for Houston. Just as soon as we figured this place out (the hardest city to navigate yet) we hit the streets and we were fortunate to catch some vainglorious sculpture and a choice photography show on China. 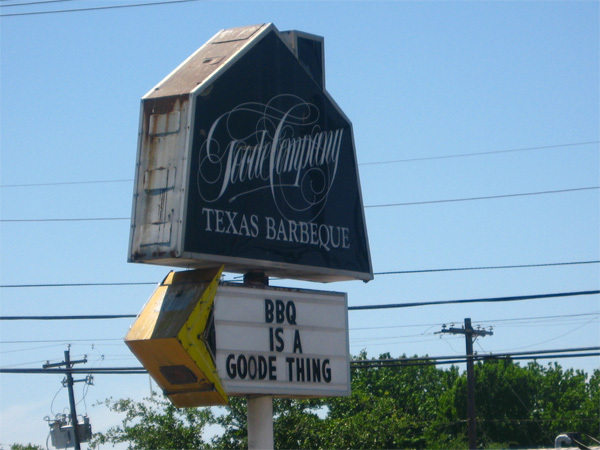 But first we ate lunch at the Famous “Goode Company BBQ”. The long, family style, picnic tables were jam-packed with Texans elbow to saucy elbow. The “Q” was served cafeteria style. We stood nose to tail in the grub line and when it was our turn the guy behind the glass wielding a large knife, sliced and chopped the animal flesh of our choice. Dennis choice; the Beef Brisket Sandwich on a homemade roll. I got roasted Turkey on homemade jalapeño bread. The BBQ sauce was a tomato base (different from Salt Lick) with a very spicy kick. Apparently these folks here like this place a whole bunch, there were droves coming and going, waiting in line and devouring every last pinch and piece. We didn’t dare publicize that we thought Salt Lick was better… we just ate our good meal quietly. After that we went for a slice of pie. 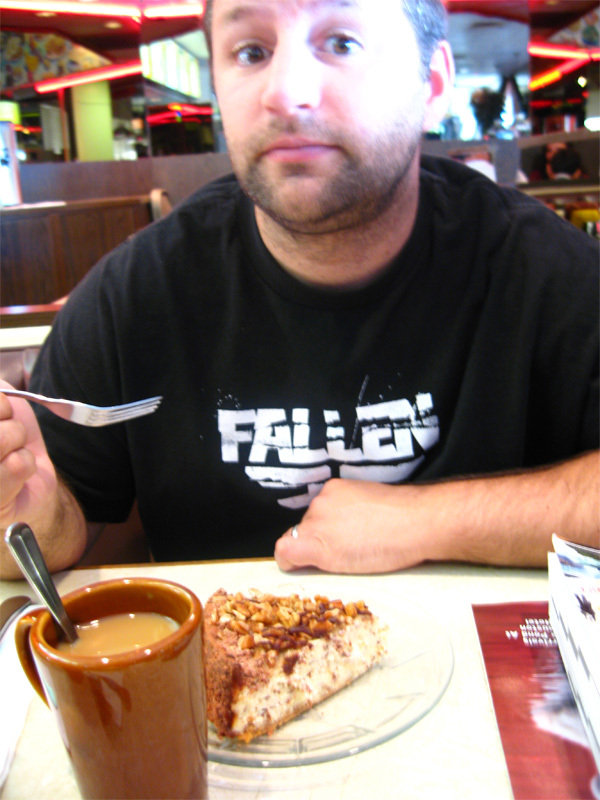 The House of Pies boasts a large selection… I got the specialty “Bayou Goo” and Dennis got the “Turtle Cheesecake”. Pretty good, but we must give kudos to Elizabeth (Elizabethan Desserts in Encinitas, CA) her Pies are supreme! We finally found some cheap hotel with free wifi, checked in and then headed right back out to see the art. Check it out. Foto Fest – Images on China. Dennis and I both really enjoyed this show. It was an unexpected thing that we happened upon this on our way to see the Giant President Heads. Giant President Heads???? Aaahhhhh and a big Bush too… What… no Elvis? 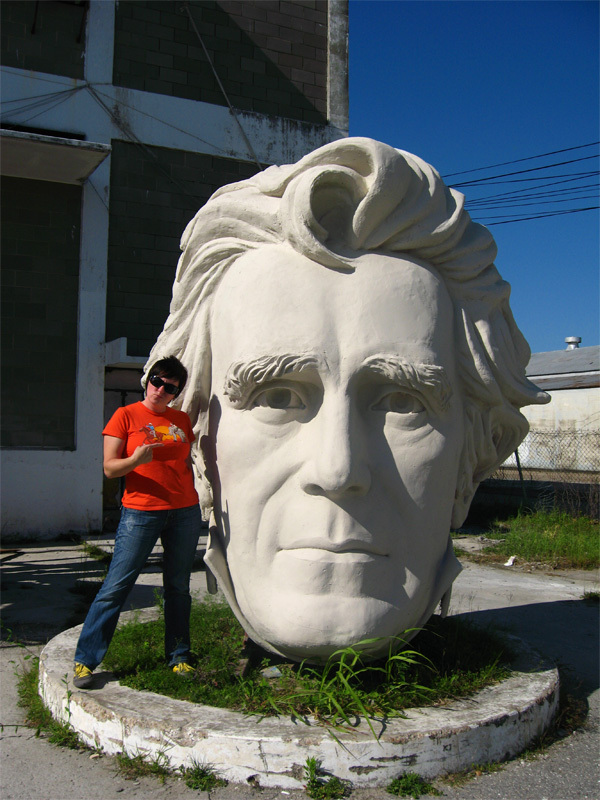 Here I am with one of my ancestors, Andrew Jackson…can you see the resemblance? 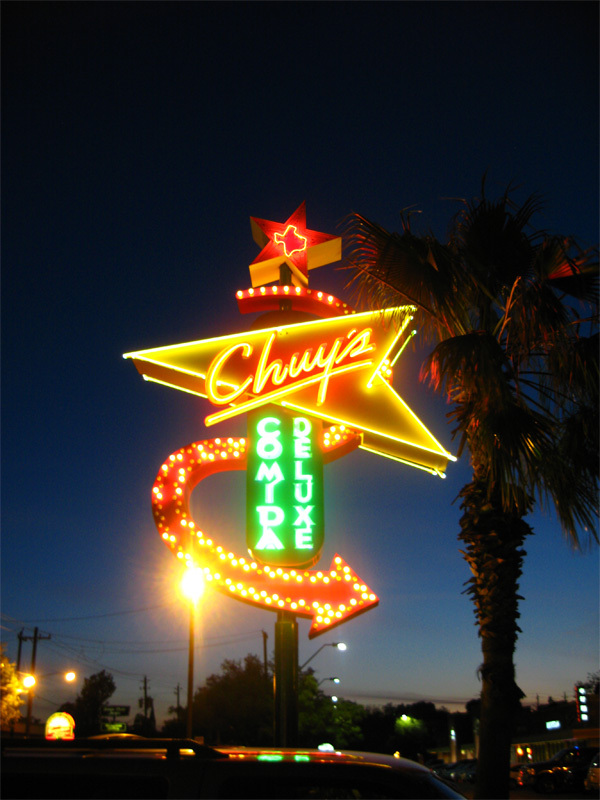 We went to Travis and Amy’s recommendation “Chuy’s”. It is a Tex Mex eatery but more importantly it is a shrine to the King. Besides the hubcap ceiling, here is where the velvet Elvis’ reigns supreme along with the “Elvis Green Chili Fried Chicken”. Dennis opted for a Chicken Chalupa and Enchilada and I got some good ol’ comfort food… veggie Enchiladas!